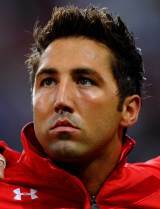 It seems increasingly likely that when critics look back on Gavin Henson's career they will be left wondering what he could have achieved had he had the focus and self-control required by top players in the professional era. For all the highs - two Grand Slams for Wales in 2005 and 2008 being at the top of the pile - his career migrated from the sports pages to the world of off-field lows and tabloid headlines. From early on Henson had a reputation as the glamour boy of Welsh rugby, all style and no substance. This glossed over the fact that when fit and fully focused he was one of the best centres in Europe and a real crowd pleaser. But gradually a succession of clubs and supporters tired of his inability to focus on his game and Henson's appeal as a player waned. He made his international debut in 2001and promised much even though his early years in the Wales set-up saw him bounce around the backline, with caps at centre, outside-half and fullback. From 2004 he was able to hold down a regular starting place, his 2005 Grand Slam success earning him a Lions tour, albeit one which ended in the disappointment of injury. In a sign of what was to come on his return he was almost immediately banned for seven weeks after being found guilty of elbowing. His form and fitness then began to be an issue, and his credibility was not helped by his media exposure, largely resulting from his relationship with Charlotte Church. But under new Welsh coach Warren Gatland, Henson looked revitalised. Starting every game of the 2008 Six Nations, he lapped up new coach Shaun Edwards' aggressive defence and became a leader of the backline. Another injury meant he missed the 2008 South Africa tour and that caused him to lose out on the following year's Lions tip. He took a self-imposed break from the game and made appearances on a succession of TV celebrity shows. It increased his public profile although hardly helped his attempts to rebuild his rugby standing; when he was absent from the Ospreys' pre-season training because he preferred to be a contestant on BBC reality TV programme Strictly Come Dancing few believed he had the necessary passion any more. The break-up of his marriage led to more lurid headlines and he moved to London to try to make a fresh start. Unable to command a regular place with Saracans he moved to Toulouse but a long-term deal never materialised after more disciplinary issues. Despite that he gained another Wales recall but did not do enough to earn the World Cup call-up he desired. When he signed for Cardiff Blues he admitted he was in the last-chance saloon; ironically an all-night drinking binge and misbehaviour on the way back from his eighth game for the club led to his instant dismissal. In July 2012 London Welsh announced his signing with the Premiership new boys his fifth club in 15 months. He remained there less than a year, switching to Bath following the exiles' relegation.